The Best Birthday Present EVER! Lily. You can read about Lily HERE. Since this top is for a 10 month old baby I really wanted to make it baby friendly. I used buttons (or snaps) instead of ties. Baby fingers like to pull on things and I didn't want Mom to have to constantly retie to the top. I also tried to use soft fabrics. I made a few from knit. I think they will be super comfy! 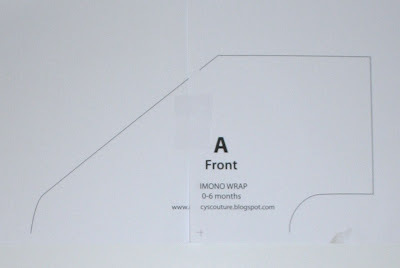 Print ou﻿t the pattern pieces. 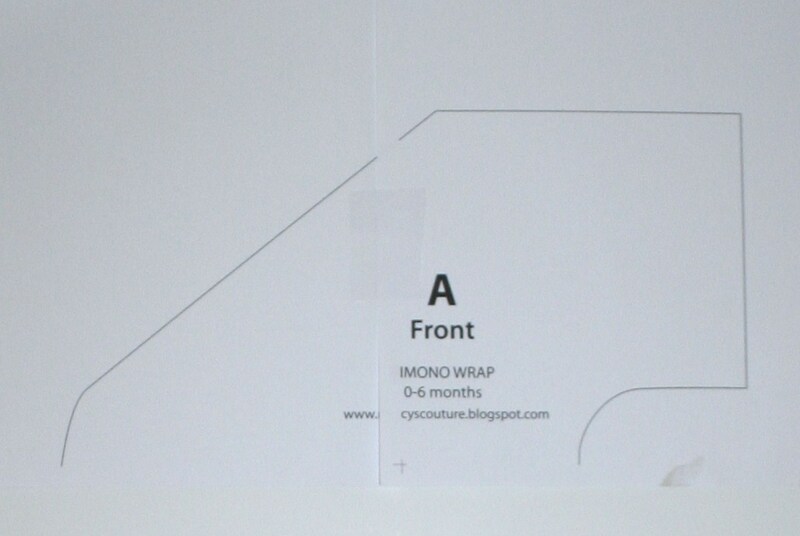 There are 4 pieces to the front and 2 for the back. In each you will notice at little mark. Grab these 2 pieces. See the little marks in the corners of the paper? Lay the papers one on top of the other matching the marks one on top of the other. Tape in place. Next grab these 2 pieces and match up the marks. Tape together. Now y﻿ou will have these 2 bigger pieces. Again match up the marks and tape together. Do the same thing with the 2 back pieces. Lay out the pattern pieces on your fabric. 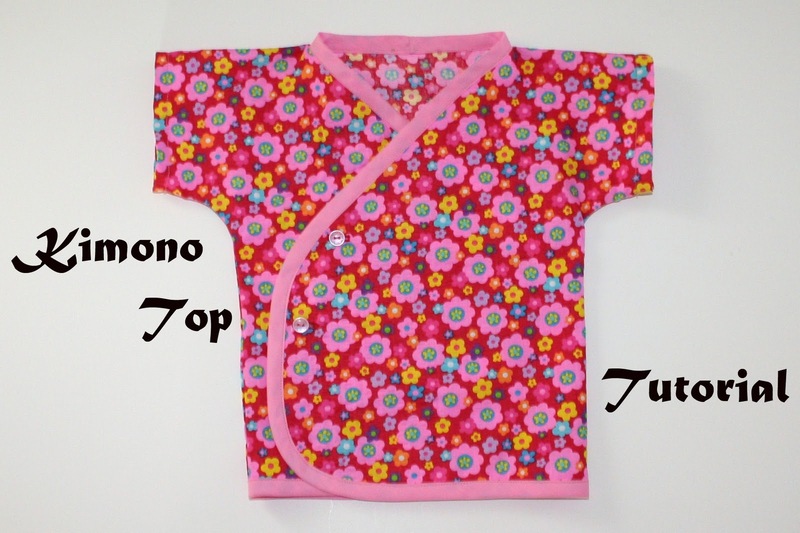 The BACK Kimono piece is placed on the fold pictured above. Cut out the pieces. You should have 1 BACK piece and 2 FRONT pieces. Lay the BACK piece down with the right side of the fabric facing up. Sew the top and the side seams. Repeat for the other FRONT piece. This is what it will look like. Pin the bias tape around the edges starting in the middle back. Over lap the bias tape and pin where the bias tape meets. You are going to sew close to the edge of the bias tape. Start sewing just past where the bias tape is over lapped. Stop sewing just before you get to where the bias tape over laps. There will be a little gap. This part can be a little tricky! Unfold the ends of the bias tape and pin right sides together. Sew. Trim excess fabric. Fold bias tape as pictured above. Fold 1/2" and then another 1/2". Mark and sew the button holes. If using snaps apply them where the button holes would go. Cut a piece of ribbon about 4" long. Fold it in half and sew a button or add a snap. Button it into the button hole or snap it together if using snaps and adjust ribbon length as needed. Stitch the ribbon to the inside seam of the left side. You can whip one up in about an hour (maybe less)! So if you have an hour or to please consider whipping one or two of these tops up for Baby Lily!!! Also if you do make a top for Lily please add it to the FLICKR pool. You can also make night gown by adding 6"to the length of the pattern. I made a couple of them for Lily too! Welcome to Make A Difference M﻿onday! Today I want to tell you about a baby girl who needs our help. When I read about her need HERE I knew right away I wanted to help! I hope you will help too!!! This is Lily. 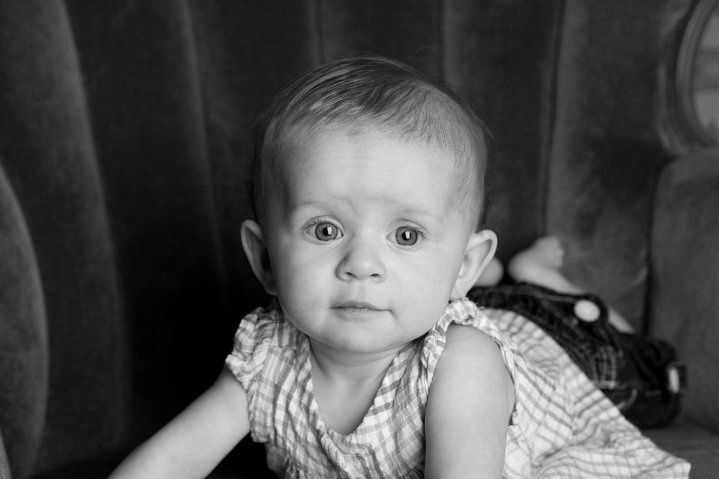 On March 22nd this sweet baby girl will undergo open heart surgery. I'm glad you asked!!! For 7 weeks she will not be able to lift her arms. She will only be able to wear kimono style tops which can be easily removed. Lily's Mom is unable to find them in stores. They are hoping to get 14 made for her so her Mom doesn't have to worry about doing laundry during the stay in the hospital. If you are able to help, please mail your kimono(s) here as soon as possible. What makes this even more special is that once Lily is done wearing these after her heart surgery, her Momma will be paying them forward to another family facing the same procedure. Not only will you be helping Lily, but other babies as well! There is also a Flicker pool set up to share photos of the kimonos made for Lily. Be sure to add the ones you make to it! I can't wait to see the kimono's that Lily recieves!!!! Typically when I write a post it is a tutorial showing you how to sew something or showing off something I've made. Today is NOT typical. I thought it would be nice for y'all to get to know me and not just the things I make. So today I am going to share my heart with you. If you read my blog regularly you know that I love to sew. What you may not know is that I am a Christian. 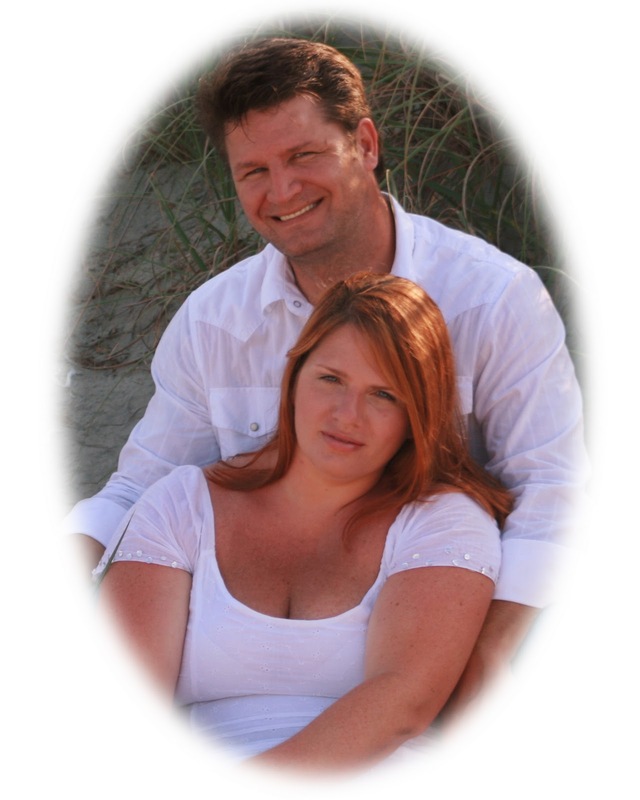 Last summer my husband and I rededicated or lives to Christ. We have tried put God first in our lives every single day. I have been trying to find to my way. I wasn't sure what path God had for me. What am I supposed do??? Have you ever felt like that? You know you are where you are supposed to be, but you don't know what you are supposed to do. So for the you wait, and wait, and wait for the answer. And then slowly you start to see what the plan is. During the Christmas season our Pastor preached about Leveraging Your Resources to be all you can be in Christ. My immediate response was " I don't have any resources". The I slowly began to realize sewing is my biggest resource. So then I was trying to think of things I could do through my sewing to show God's love to others. I was stumped!!!! Two weeks ago the ideas started flooding in to my head. I made a list of these ideas. Some of these ideas are huge! Asl I looked at my list all I could think was there is no way I can do this. I'm just a Stay At Home Mom. There is no way I can do this! Wouldn't you know the next day, Sunday, in the Pastors' sermon he said " You are not just a stay at home Mom. God wants to use you to change lives." All I could think was Wow!!!! I know in my heart that was for me. I really needed to here that! So I'm going to step out and follow this path God has laid out for me. I'm just taking it one step at a time. My first step is a baby step. Each Monday I am going to tell you what I am doing that week to make a difference in someone's life. It might be as simple as sending a card to someone or it could be making something for someone in need. I really hope you will join me in this!! I am sooo excited about this and I can't wait to get started Monday. Tonight I feel so blesse﻿d!!! Tragedy is all around us. Everywhere. All the time. It can strike in the blink of an eye. I just read a blog post about a family that just lost their 4 month old baby. She was healthy, never was sick. She just stopped breathing. I can't even imagine how that Momma feels. It is uncomprehendable!!! It is soooo tragic. I cried and cried as I read about that little baby girl. My heart is overwhelmed with saddness for this family. At the same time I feel soooo blessed. and these 2 sweet kids. I feel guilty for being frustrated with my kids today. I feel guilty for thinking "I wish Dakota would just stop talking for 5 minutes". I feel guilty for thinking "What is Aiyanna whinning about now?" I feel guilty for thinking "I need a break." They could be gone in the blink of an eye. And I would miss all of the things that frustrated me today. I am so thankful that I have my kids here and healthy!!! So grateful to get to be a Stay At Home Mommy!. I remeber when I was a working Mommy and felt like I didn't get to spend much time with them. Now I get to spend all day with them. Sometimes I forget how truly blessed I am! Now please excuse me while I go give my kids extra hugs and kisses! Sometimes when I make a quick trip to the store, just to get a couple things, I don't like to lug my purse in. Now I can just throw my phone, keys, and money in here and slip it on my wrist. I can carry the things I need and still hold the kids hands. Perfect solution. You know you need one! All you need is 2 fat quarters, fusible interfacing and a 7" zipper. Cut 4 rectangles 8" x 5" from the fat quarters. These will be the outside and lining of the wristlet. Also cut 2 rectangle 8" x 5" from the interfacing. For the strap cut a rectangle 3.5" x 16" from the fabric and the interfacing. Iron the interfacing to the outside fabric and the strap. Fold the strap in half and iron. Open up the strap and fold each side to the middle crease as pictured. Here's what it will look like. Now top stitch down each side 1/8" from the edge. Grab one of your outside fabrics and lay the zipper on top of it. Right sides together. Stitch. Now lay the lining fabric on top of it. Right sides facing. Stitch. Flip the fabrics so wrong sides are facing and top stitch close to the edge. Repeat on the other side of the zipper and this is what you should have now. Fold the strap in half and baste about 1/2" down from the zipper. Fold the fabrics back out so outside fabrics are facing and lining fabrics are facing. Stitch. Make sure to leave an opening on the lining side to turn right side out. Turn right side out and stitch the lining opening closed. Now go make a bunch of these. They would be great to slip some money or a gift card in for a gift. I think they would be great for new Mommies too! They can put their stuff in it and slip it inside the diaper bag. Hope you are having a wonderful week!! !